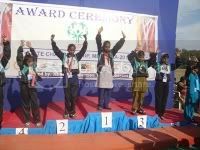 1100 athletes participated in the 7th state championship of Special Olympics for the athletes with mental disabilities in Mehsana between 3rd and 5th January. One year of hard training won medals for our partner NGO Blind Welfare Council, Dahod. A reminder to inform NGOs across the country to send in their entries for the India NGO Awards 2010. For more info, email or download the form here. Last date to apply Feb, 15, 2011. 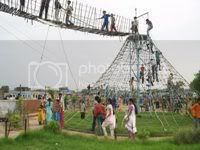 Our partner NGO, SPRAT - Society for Promoting Rationality has built a model park, called the AUDA MUSKAAN Park for Adventure, Science and Harmony now stands at the so-called ‘border’ of the Hindu-dominated Vejalpur and the Muslim-dominated Juhapura in Ahmedabad. This 2500 Sq mts Park has five different sections for different age groups, hosting play, science and educational equipments and a multipurpose furnished 3500 Sq ft auditorium called MARKAZ -Centre for Fun and Learning where 200 people can be seated comfortably. Rational, pro-poor NGOs/ CSOs sharing the ideals of secularism, science, harmony and empowerment can use the park and auditorium. The mission of GIAHC, the international arm of the National Cervical Cancer Coalition is to reduce the global burden of cervical cancer by safe, simple and inexpensive methods. Lack of an organized screening program is the main reason for high rates of cervical cancer in India. We are working on a model where community health workers (CHWs) and NGOs can be trained in a 12 days training program at the Cancer institute in Chennai. Write to giahc@nccc-online.org if interested. Inviting NGOs to sell their products at ‘The Bombay Store’ in Bangalore, Mumbai, Navi Mumbai and Pune. This NGO Corner provides an opportunity to reach steady revenues and NGO gets more visibility from the marketing activities carried out. Email Prasad for further queries. We are delighted to share with you that Dhaval Udani has recently taken over as GiveIndia's new CEO. Dhaval, a 33 year old alumnus of the Indian Institute of Management, Ahmedabad, and a Computer Science graduate from the VJTI, Mumbai, was the CIO and Head of strategy at GiveIndia since 2008. Dhaval worked for 3.5 years at consulting firm AT Kearney after his graduation from IIM Ahmedabad, and for 2 years during this period, he volunteered approximately 20 hours every week (in addition to a 60 hours a week day job). He eventually gave up his cushy corporate job to try and make a difference. Dhaval has led the Internet and retail philanthropy initiatives of GiveIndia between 2008 and 2010, before taking over as our CEO now. Earlier this year, Dhaval was chosen among 30 business leaders and CEOs in India to be part of the Aspen India Leadership Initiative, that boasts alumni such as Vivek Pandit of McKinsey, Meher Pudumjee of Thermax, Shivinder Singh of Fortis and Vishakha Mulye of ICICI Ventures, besides NGO leaders like Manoj Kumar of Naandi Foundation. We have verified the FCRA and Non FCRA Bank a/c details with our partner NGOs several times. But still we face a situation of funds not being transferred due to incorrect bank details. This is to inform that we will be imposing a penalty of Rs.500 for the disbursement failures. Inform listing@giveindia.org for any change in bank details. Free subscription to bimonthly newsletter "Philanthropy" published by Center for Advancement of Philanthropy"
Please write to Mr S N Srivastava at Credibility Alliance. 2011 has started off well for the Monthly Giving programme. 2 of the biggies of the IT sector, Tata Consultancy Services and Tech Mahindra have signed up to implement the programme. There is huge potential to be tapped in both these companies. For the first time, we have commenced monthly giving through bank account standing instructions. GiveIndia has partnered with ICICI Bank and HDFC Bank for the same. We should be rolling out with other banks as well. Click on the link to read a valuable feedback report with a meaningful photograph showing clearly the benefits provided. Do you receive Corpus Fund donations? Click on the image below to read an interesting article on Corpus Fund. Copyright 2010 GiveIndia.org. All rights reserved. 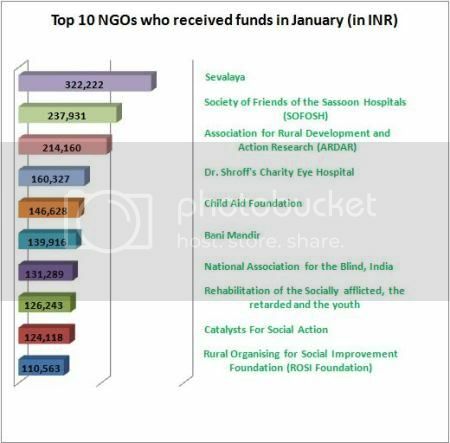 This newsletter is sent to you because you are a registered user of GiveIndia.org or because you have requested to be subscribed to the newsletter. Send a mail to listing@giveindia.org with the word "Unsubscribe" in the subject, if you would not like to receive future mailings. If a friend of yours wants to subscribe to the newsletter ask him/her to send a mail to listing@giveindia.org with the word "Subscribe" in the subject.